Often times when I travel with my son, we spend part of a day on some kind of tour through the city we are visiting to get the lay of the land and sometimes as a way to get around town. Many people roll their eyes and groan at the thought of a tour because they have the perception that they are long, boring and to touristy. I was one of those people before I had a child. That all changed on a visit to Boston, when all my misconceptions were washed away as my son and I splashed down in the Charles River in a W.W.II amphibious landing vehicle. We boarded the “DUCK” at the Museum of Science and was greeted by a ConDUCKtor. Once we were off, we quaked through the streets, while taking in the many sites that make Boston the birthplace of freedom. Of course there were a few sites that were not revolutionary, like Cheers from the 1980’s TV show. We didn’t see Sam and Norm, but we did get to check out some pretty nice views of the Boston and Cambridge skyline when we splashed into the Charles River. 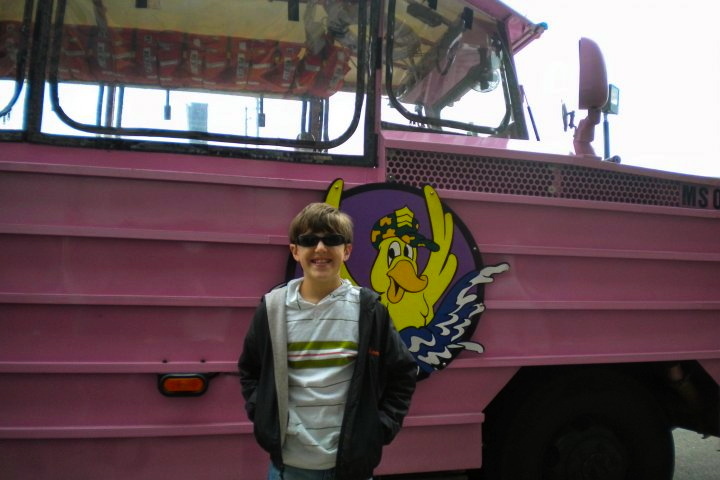 This was my son’s favorite part of the tour and was thrilled when he had an opportunity to drive the DUCK. My son taking the wheel of the Duck on the Charles River. Our ConDUCKtor was great and I regret that I can’t remember his name. I do remember his sense of humor and some interesting tidbits that he shared. For instance while we were cruising along the Charles River, he pointed out what was once the Charles Street Jail and shared a story of James Curley, who was the Mayor of Boston and served not one, but two prison terms. He also pointed out a segment of the Berlin Wall which was located outside the main entrance of the EF Education building in Cambridge. I sure didn’t expect to see a piece of world history in front of an office building. I can’t leave you scratching your head, so in case you’re wondering EF Education is a world leader in international education and they offer study abroad programs. Ah, now it makes more sense. Quacking through Boston while learning little known facts made our tour fun and educational. Where else can you learn about our revolutionary leaders on a World War II vehicle that is half a boat and half a truck! 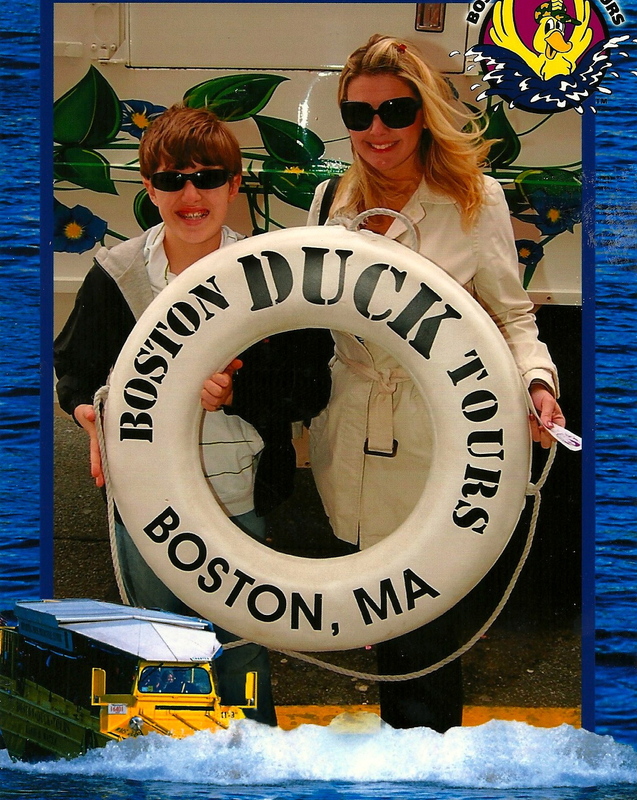 The Boston Duck Tours was one of the highlights of our visit to Beantown. Boarding the Duck at the Museum of Science in Boston. 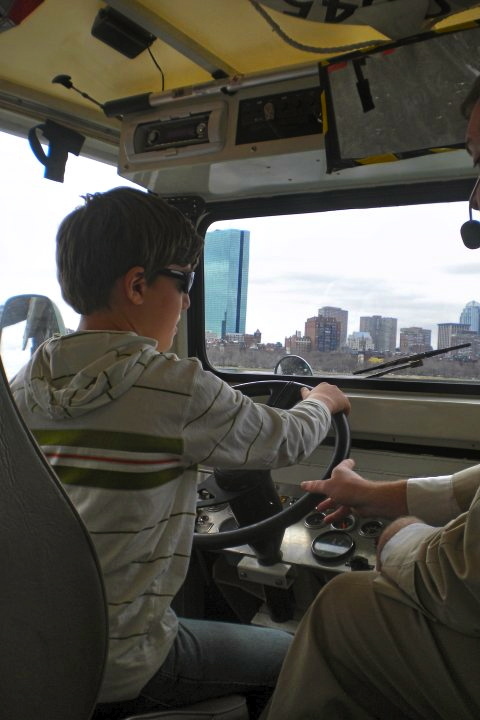 So my first question is …has your family taken a DUCK tour in Boston or another city? The second is did you throw away those noisy duck lips when your kids were not looking? If you enjoyed this post, you also might like America’s Oldest Restaurant and Following the Red Brick Road – Boston’s Freedom Trail. Great timing, because we’re headed to Boston next week! I’m with you; guided tours can be a great way to get the lay of the land when you first arrive in an unknown destination! Have fun in Boston Traci! It is one of my favorite cities. If you have time try to get to Lexington & Concord – The Minute Man National Park is fabulous 🙂 BTW, I am going to TBEX too in Toronto! Yeah!